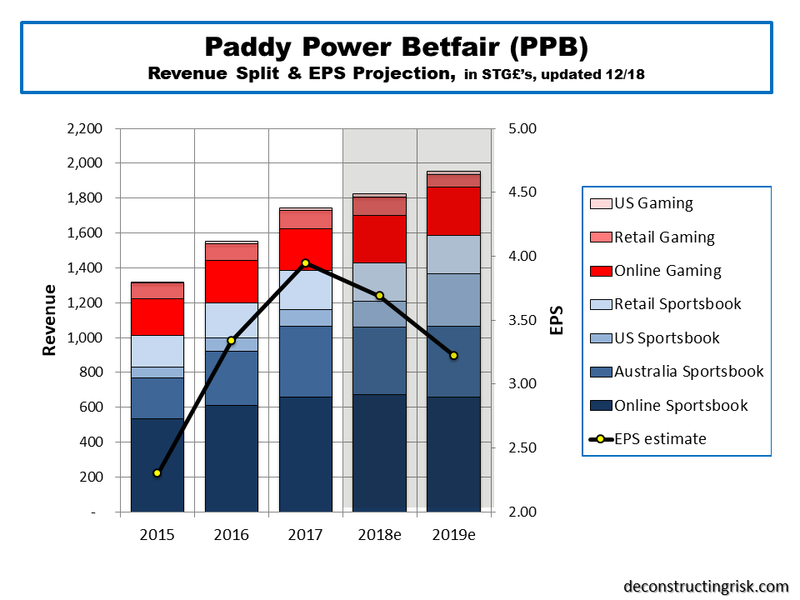 Since I last posted on the gambling sector in March, the bad news just keeps on coming for the sector. The one bright spot has been the opening of the US market although, as my last post highlighted, the US business is on the lower end of the margin spectrum and there is considerable investment needed as the market opens. William Hill (WMH.L), GVC (GVC.L) and Paddy Power Betfair (PPB.L) are down 50%, 30% and 15% since my March post. Some of the issues hitting the sector include the UK reduction in stake limits to £2 on gaming machines, the UK increasing the rate of remote gaming duty from 15% to 21% in 2019, new point of consumption taxes and restrictions on advertising in Australia, and increases in betting taxes in Ireland. Compounding these issues is a fiercely competitive environment with operators such as the privately owned Bet365 being very aggressive in sectors such as horse racing. To illustrate the impact on PPB, my estimates below show a declining EPS for 2019 (the firm estimated all the changes impacting EBITDA by £115 million against their 2018 EBITDA midpoint estimate of £472 million, that’s a 24% hit!). My 2018 and 2019 EPS estimates are now down from £4.36 and £4.51 to £3.70 and £3.25 respectively. That’s an approx 15% and 30% cut for 2018 and 2019 respectively. At the closing price today of £63.85, my 2019 EPS estimate implies a PE multiple of 20, way too scarily high given the headwinds in this sector and the overall market direction. The US represents the one bright spot in terms of top-line growth although I would be skeptical about the US business having a major bottom line benefit for a few years yet. I did say previously that his sector is haunted by regulatory risk, haunted to the point of being scared to death! If you exclude investing, I am not a gambler. However I do find the gambling sector fascinating. I have been posting on the sector for over four years now (see posts under Gambling Sector category). As an example of an old bricks and mortar sector that has been revolutionised in recent years by the internet and smart phones, it is illuminating. As I said in a previous post, “this sector is haunted by regulatory risk” and this post will run through some regulatory developments, as well as business ones. 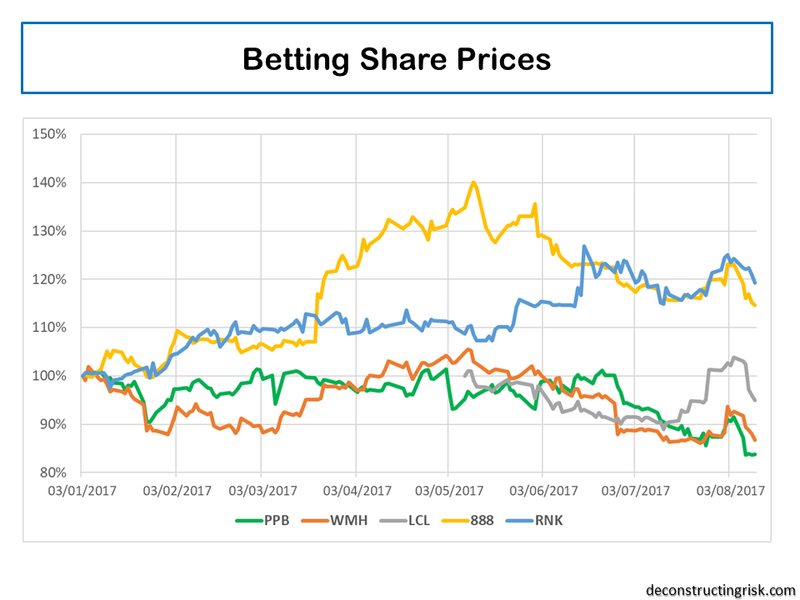 Late in December last year, Ladbrokes Coral (LCL) agreed to a takeover deal by GVC, the Isle of Man consolidator who owns BWIN, Sportbet, PartyPoker and Foxy Bingo. The smaller GVC, with 2017 revenue of €0.9 billion, structured an innovative deal for the larger LCL, with 2017 revenue of approx. £2.4 billion (I will update these figures when LCL announces its final 2017 figures in the coming days), with a sliding scale valuation based upon the UK Government’s triennial review of the sector. The UK regulator and the government’s adviser on the issue, the Gambling Commission, today released its advice on fixed-odds betting terminals (FOBTs), often described as the “crack cocaine” of gambling. The Gambling Commission recommended a limit of £2 for “slot” style games, called B2 slots, and “a stake limit at or below £30” for other non-slot B2 games, such as the popular roulette games. Although LCL and William Hill shares popped today, the final decision is a political one and its by no means certain that a limit lower than £30 will not be implemented. 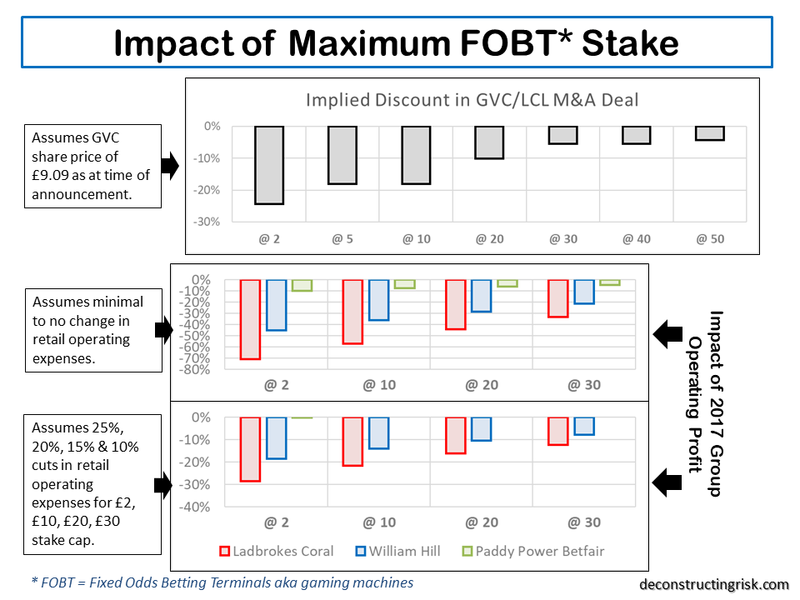 Based upon the sliding scale in the LCL/GVC deal and some assumptions on retail operating cost cuts based upon different FOBT stake limits, the graphic below shows the potential impact upon the business of LCL, William Hill (WMH) and Paddy Power Betfair (PPB). Again, LCL is based upon H1 results extrapolated and will be updated for the final 2017 figures. Based upon very rough estimates, the limits recommended could result in around 400 to 700 betting shops disposals or closures by the bigger firms, albeit that these shops are likely to be the least attractive for rivals or smaller firms. These estimates do not take into account potential mitigating actions undertaken by the betting firms. Lost FOBT revenue could be made up by increased sports betting facilitated by the introduction of self-service betting terminals (SSBTs) which allow punters to gamble on new betting products. Point of consumption (PoC) taxes have been introduced in countries such as the UK and Ireland in recent years and are now payable in South Australia and have been announced in Western Australia. The other states in Australia are likely to introduce PoC taxes in 2019. These developments caused WMH to take a write-down on its Australian operations and sell them in March to the Canadian poker firm the Stars Group (formally the colourful Amaya), owner of PokerStars, PokerStars Casino, BetStars, and Full Tilt. The Stars Group (TSG) also increased its ownership in the Australian operator Crownbet in March which it intends to merge with the William Hill Australian operation. PPB was reported to have been interested in Crownbet previously but was obviously beaten on price by TSG. PPB had the exhibit below in their 2017 results presentation on the non-retail Australian market. A more positive regulatory development in the coming months could be a favourable decision by the US Supreme Court on the future of the Professional and Amateur Sports Protection Act of 1992 (PASPA). This whitepaper from the Massachusetts Gaming Commission gives a good insight into the legal issues under consideration and the implications for the sector in the US of different Supreme Court decisions, such as upholding PASPA or a narrow ruling or a full PASPA strike down. Other issues in the US include the terms under which individual States legislate for betting. The consultants Eilers & Krejcik opine that “a market incorporating both land-based and online sports betting products could be worth over two times a market that is restricted to land-based sports betting alone” although they conclude that “many – perhaps even most – states will choose to delay or forgo online”. It may be likely that many States will follow Nevada’s example and require online accounts to be initiated by a land-based provider with age and ID verification conducted on premises. Sports betting in the US is generally low margin with WMH reporting US gross win margins around 6%. Other tailwinds to the US sector include rent seeking participants such as the sports bodies looking for “integrity fees”, a figure of 1% on the amount staked (called the handle in the US) have been suggested, or aggressive tax policies and levels by individual States. This paper by Michelle Minton outlines some fascinating background on PASPA and argues that any legalisation of betting across the US must be pitched at a level to counter the illegal market, estimated at $120 billion per year to be 20 times the size of the current legal sector in the US. So, they are some of the regulatory issues challenging the sector today. 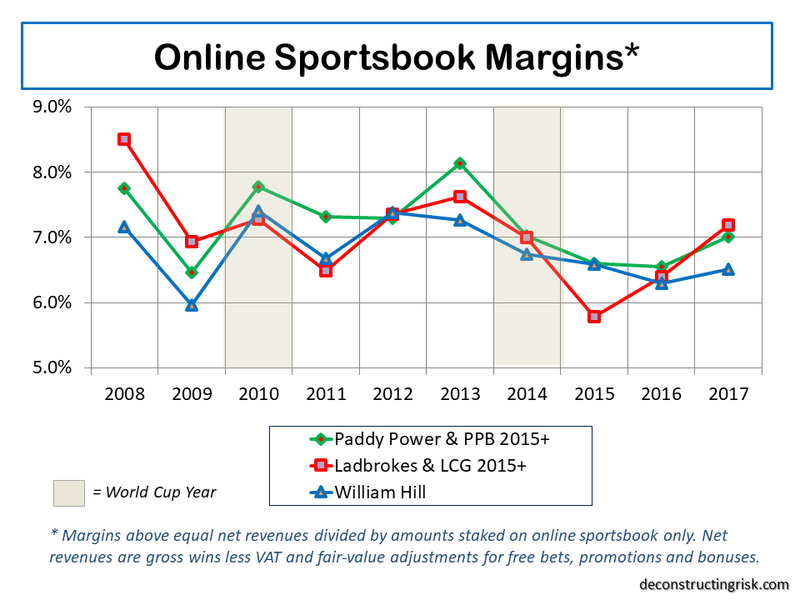 In terms of historical and 2017 sportsbook margins shown below, I have spend some time revisiting my data and extracting more accurate data, particularly in relation to historical Ladbroke sportsbook net revenue margins. H2 sportsbook results, particularly Q4 results, were very favourable for the bookies. 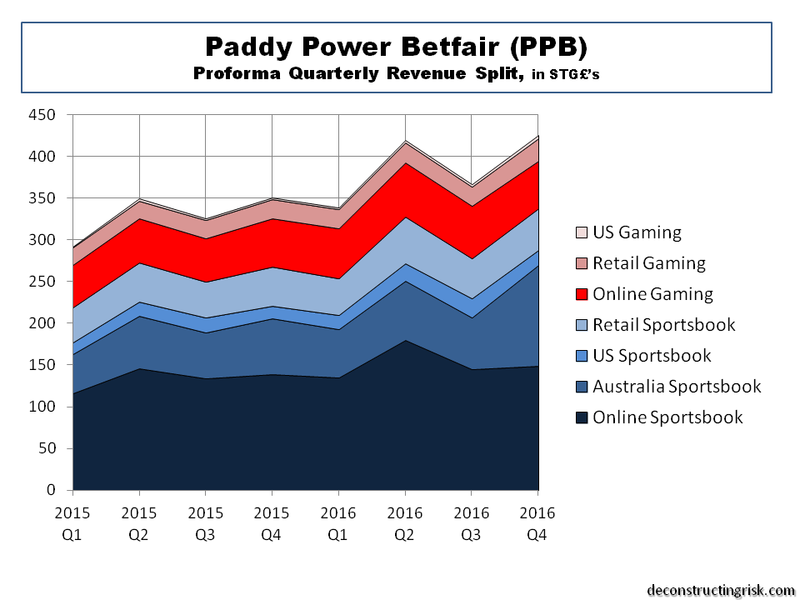 I estimate that the Q4 figures for PPB improved their full year net revenue margin on its sportsbook by 120 basis points. I debated whether to adjust the 2017 figures for the Q4 results but decided against it as the results reflect the volatility of the business and good or bad results should be left alone. It is the gambling business after all!!! As above, the LCL numbers are those extrapolated from H1 results with an uplift for the H2 favourable results and will be updated when the actual results are available. On the specific results from PPB, their 2017 EPS came in at £3.98, ahead of my August estimate of £3.72 for 2017 (see post here) but still behind my more optimistic March estimate of £4.14 (see post here). 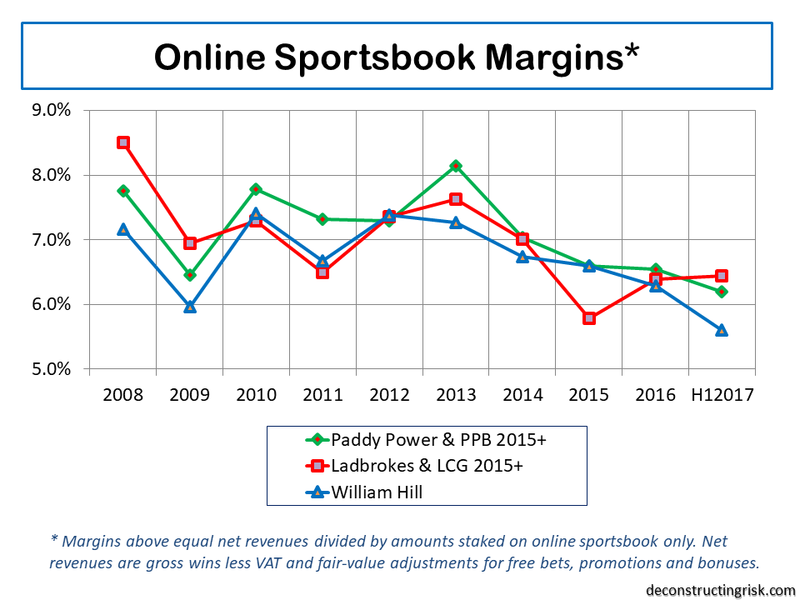 The lacklustre online sportsbook results are a concern (revenues up 8% compared to 14% and 25% for WMH and LCL respectively), as are the declining online gaming revenues. Increases in PoC taxes in Australia will impact operating margins in 2019 and FX will be a tailwind in 2018. Increased IT resources and investments in promoting new products and the Paddy Power brand are the focus of management in 2018, ahead of the World Cup. Discipline on M&A, as demonstrated by walking away from a CrownBet deal, are also highlighted as is potential firepower of £1.2 billion for opportunistic deals. My new estimates for 2018 & 2019, after factoring in the items above, are £4.36 and £4.51 respectively, as below. These represent earnings multiples around 17 for PPB, not quite as rich as in the past, but justified given the 2017 results and the headwinds ahead. PPB must now show that it can deliver in 2018, a World Cup year, to maintain this diminished but still premium valuation. The coming months in this sector will be interesting. The fate of firms such as 888, with a market cap around £1 billion, will likely be in the mix (interesting that its fits within PPB’s budget!). WMH and 888 have tangoed in the past to no avail. Further dances are highly likely by the players in this fascinating sector. 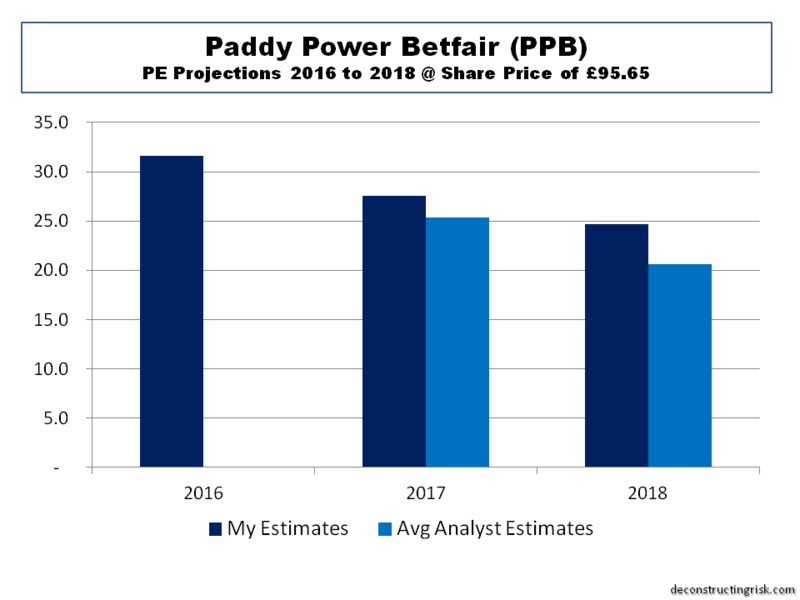 The last time I posted on Paddy Power Betfair (PPB.L) in March, I highlighted the rich valuation and cautioned better value may be had on future dips, ending with the comment that “the game of speculation is all about getting the best odds”. Well, PPB.L has been on quite a ride in recent months. First the prospect of disappointing operating results put the stock under pressure and last week the bombshell that the golden boy CEO, Breon Corcoran, wants to do something more meaningful with his time. The result, as can be seen below, is PPB.L down 15% since the start of the year and 20% since this time last year. The revenue for the latest quarter, even after adjusting for the lack of the Euro soccer tournament in 2016, disappointed analysts who are fretting about whether reduced net revenue margins are part of a trend. Despite the firm putting reduced net revenue margins primarily down to unfavourable sports results (increased promotion costs also contributed, doing things like paying out on Hilary Clinton prior to the actual election results doesn’t help! ), the worry is that competitive pressures rather than bad luck are resulting in reduced net revenue and gross win margins. [Net revenues are gross wins less VAT and fair-value adjustments for free bets, promotions and bonuses]. Care needs to be taken when comparing gross win margins (i.e. gross win divided by amounts staked) and net revenue margins across firms as the make-up of the underlying portfolio is important (e.g. gross wins varies by sport type such as football, horses, tennis, etc and by geography) and firms may account for certain items differently. Also, the absence of the largest online player, the privately owned Bet365, makes industry analysis difficult for amateurs like me. Of course, this sector is haunted by regulatory risk. The predicted restrictions of the highly addictive gaming machines by the UK Government is expected to impact PPB’s high street competitors much more that PPB.L. 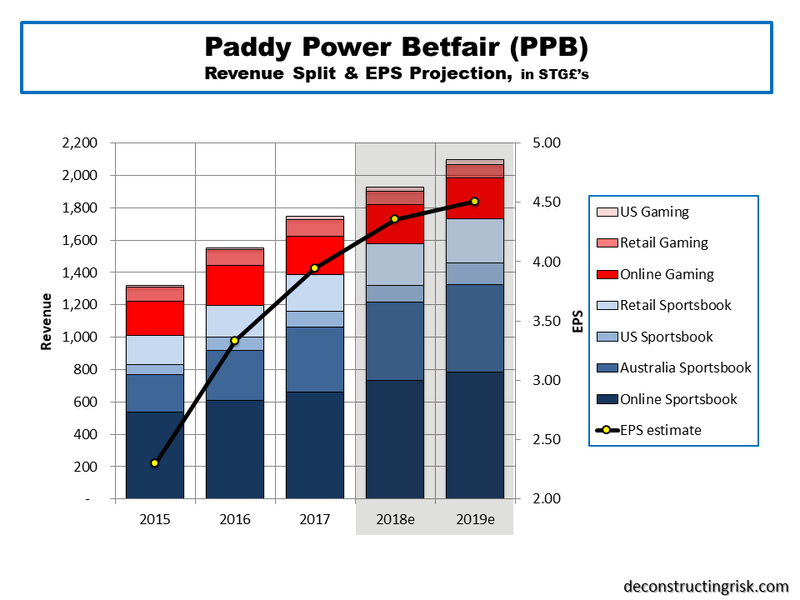 For example, PPB.L only derives 6% of its revenue from gaming machines compared to 30% for William Hill. The reaction of PPB’s competitors to compensate for restrictions on gaming machine revenue is likely to have a bigger potential impact on PPB.L’s future results. For me, the biggest disappointment in the Q2 results wasn’t the revenue line but the operating margins. The full year 2017 EBITDA projection was nearly 10% shy of my estimates. The firm acknowledged that the platform integration has been taking longer than planned and took up over 70% of internal technology resources in Q2. This is projected to reduce to 60% and 30% in Q3 and Q4 respectively before been completed by year end. Releasing these resources will allow a refocus on product development and on fixing other problem areas such as their online gaming offerings. As a result of the Q2 results, I have taken a knife to my earnings estimates (my revenue estimates only required minor adjustment) for 2017 and 2018, as the graphic below shows. My 2017 and 2018 EPS estimates have reduced to £3.72 and £4.01 respectively, down 10% and 12% from my previous estimates. That puts PPB.L’s current market cap at a PE of approximately 20 and 18 for 2017 and 2018. That’s not bad for a firm with EPS growth of 13% and 8% for 2017 and 2018 respectively although, if these figures turn out to be accurate, the share price is likely to have gone lower that it currently is on worries about reducing operating metrics in a fiercely competitive market. These estimates are conservative in my view, possibly overtly so. They reflect a sense that Breon Corcoran’s reason to go off into the tech sunset now is really due to concerns about the medium-to-long term prospects for the sector. Corcoran obviously has put a different explanation forward, one which is suspiciously unconvincing given the amount left undone at PPB.L, although he still does have about £40 million of share options in PPB.L. No firm is simply about the CEO and at the end of the conference call an indication was given of ensuring more exposure to the full management team in future investor engagements. That should help investors get more comfortable with management depth at the firm. I know nothing about the new CEO, Peter Jackson, so he has a real challenge in gaining investor’s confidence. He has big boots to fill as far as investors are concerned. So, yet again, I suggest the best course of action is to wait, both for existing and new shareholders, and see how 2017 develops for PPB.L. There can be little doubt that recent events mean that the odds on PPB.L have lengthened. The last time I posted on Paddy Power Betfair (PPB.L), I highlighted it was looking pricey in the mid-to high 90s. It has since traded down to the eighties and recently dipped below £83 after the full year results. Although it has now quickly recovered up around £88, the initial disappointment over the online revenue in Q4 sent the stock down 6%. 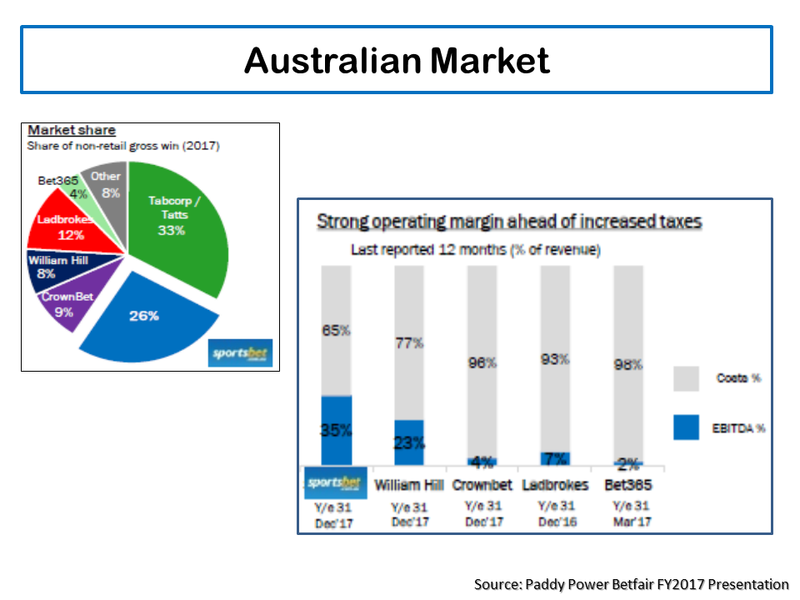 The graph below shows quarterly revenues, which met expectations largely due to the favourable A$ rate with Australia revenue up 34% in sterling but only 18% in the underlying currency. Management make a point of stating that “approximately 70% of our profits are sterling denominated, and accordingly, we are not exposed to FX translation fluctuation”. Events such as the summer 2016 Euros contribute to the revenue spike in Q2 2016. They exceeded my expectations on the bottom line with an operating profit of £182 million for H2 over my expectation of £160 million, with the merger expense and intangible write-off impacts of £300 million for the full year stripped out. The EPS of £3.30 for 2016 on average 80 million shares was impressive. I messed up on the average share count (again!) in my previous EPS estimate. 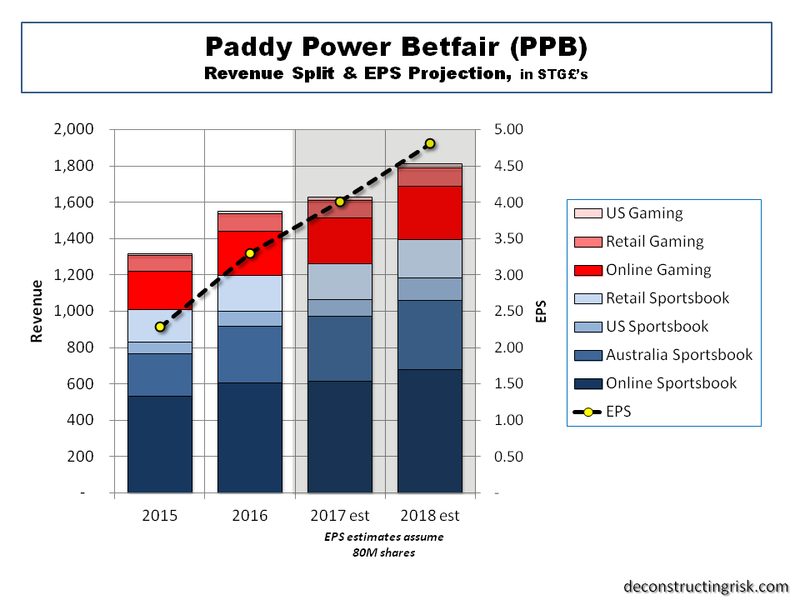 PPB stated that they “expect to complete the integration of our European online platforms by the end of 2017” and “until then, new product releases on the Paddy Power brand will be relatively limited, but on completion customers will see immediate benefits”. 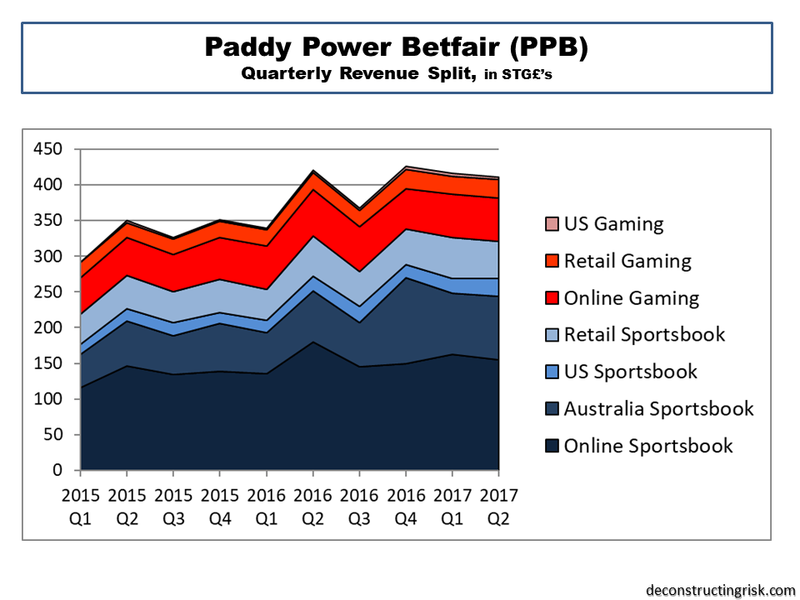 Despite their market beating margins on their dominant online segment, they caution that “a lot of the sportsbook operators acknowledge that gaming got harder in the second half of last year” and they always emphasis that they operate in a very very competitive market. It looks to me like PPB management are trying to carefully manage expectations for 2017 and are likely nervous that large competitors like William Hill and Ladbrokes could possibly recover from recent online slumps and (just maybe) finally get their act together online. 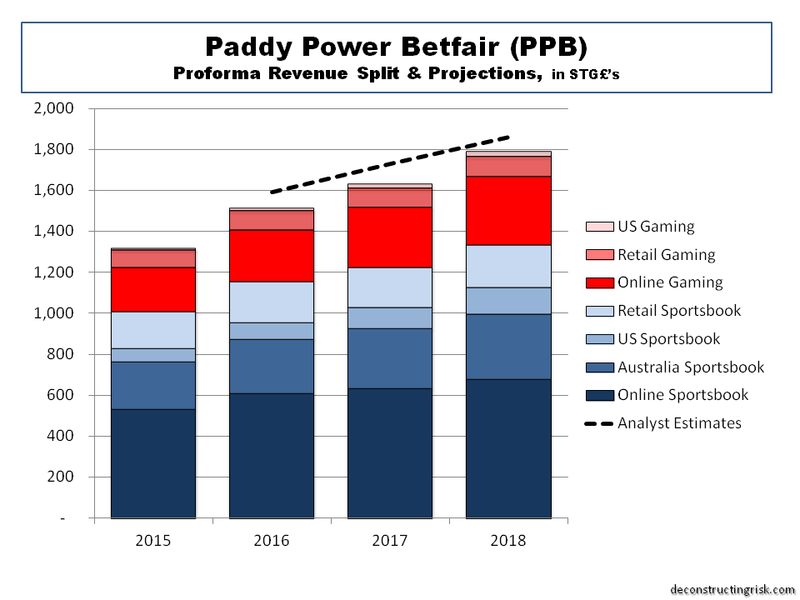 There is an ongoing regulatory headwind in this business and 2016 bought items such as the online gaming point of consumption tax, the statutory Horserace Betting Levy, and the UK Competition and Markets Authority (CMA) investigation into UK online gambling (update due in April) to the fore. In addition, South Australia announced a 15% consumption tax effective from July 2017. The UK Government’s Review of Gaming Machines is a much bigger deal for PPB’s larger competitors as it only makes up 6% of their revenue. PPB have substantially completed the integration of risk and trading functions which means that Paddy Power proprietary pricing and risk management tools are now used for over 85% of the bets on the Betfair sportsbook across 19 sports. They stated that “operating two individual brands on an integrated shared function is also proving to be beneficial for efficiency” and that the “pooling of analytics data has improved our econometric modelling, giving us greater insight into the effectiveness of marketing activity and leading to improved optimisation of spend”. These are critical factors in why PPB is differentiating itself operationally from its peers and are important to the success of the business model envisaged by the merger. So, although I have likely got the share count wrong again (I am assuming an average of 85 million this time across 2017 and 2018), my new projections are below. I estimate growth of 5% and 11% for revenue in 2017 and 2018 respectively and EPS growth of 14% and 20% respectively. I factored in a degree of topline and bottom line upside in 2018 from the soccer world cup in Russia (assuming politics hasn’t messed up the world order by then!). That represents a PE multiple of 19.4 on an 2018 EPS estimate at a share price of £88 (2017 PE of 23.3). Not bargain basement cheap but not crazy mad either. With a targeted payout rate of 50%, my estimates could mean a dividend yield of 2% and 3.5% for 2017 and 2018 (again at a £88 share price). That looks like a better dynamic that the one at a share price in the mid to high 90’s, as per my post in August. If only I wasn’t so negative about overall valuations across the market, I would have added to my PPB position on the dip after the results last week. [Customary caution: PPB is not for the faint hearted, it is the gambling business after all!]. My instinct tells me markets will be bumpy in the coming months, valuation wise (e.g. rising interest rates, politics!). That may prove an opportune time to get more of PPB at a good price. After all, the game of speculation it is all about getting the best odds! It has been about 10 months since I posted on the potential for the Paddy Power and Betfair merger and a lot has happened since. Brexit and the resulting sterling volatility are obvious events of significance. In the betting sector, consolidation has continued with the Ladbrokes and Gala Coral merger having been announced and approved. The audacious proposed tie up by Rank and 888 on William Hill floundered with recent press reports suggesting Rank and 888 could get together. The consolidation in this rapidly changing sector is far from over. The initial optimism on the future prospects for the two high achieving entities, Paddy Power and Betfair, resulted in the share price trading above the £100 level earlier in the year. Following Brexit, it traded as low as £80. The merged firm reported their H1 figures earlier this week which showed the full extent of the merger costs and provided an increased cost synergies figure for 2017 of £65 million. With 75% of EBITDA being sterling based, the currency impact was not as material as their multi-jurisdictional operations would suggest. Top-line results for H1 do however indicate that 2016 revenue growth will likely not be as high as the 17% I had expected in November. The reality of issues in this regulated and highly competitive sector also served as a reminder that the path may not be as smooth as initially hoped for. Regulatory headwinds in Australia were an example. As a result, I revised my revenue estimates in November from £1.64 billion to £1.51 billion. The graph below shows the breakdown of my revenue estimates for the next few years with a comparison to overall average analyst estimates. Also, I have revised my previous earnings estimates with an operating profit margin of 20% for 2016, growing to 22% in 2017 and 23% in 2018. Based upon a share count of 86 million as at end June 2016 (which includes 2 million treasury shares), I estimate the H2 EPS at £1.55 which when added to the H1 EPS of £1.45 gives a full year 2016 EPS of £3.02. [ This 2016 estimate does represent an operating EPS of £3.79 which compares to my November estimate of £3.85 albeit that the November estimate was based upon suspect figures like the share count!!]. At today’s share price of £95.65, the PE multiple for 2016 is a hefty 31.6. The graph below shows the multiple based on my EPS estimates for 2016, 2017 and 2018 compared to those using the average analyst estimates. In conclusion, I remain optimistic about the business model of Paddy Power Betfair particularly given the proven quality of the management team and their history of execution. However, quality doesn’t come cheap and the current valuation is priced for perfection. For new investors, it may be prudent to wait for a better entry point.